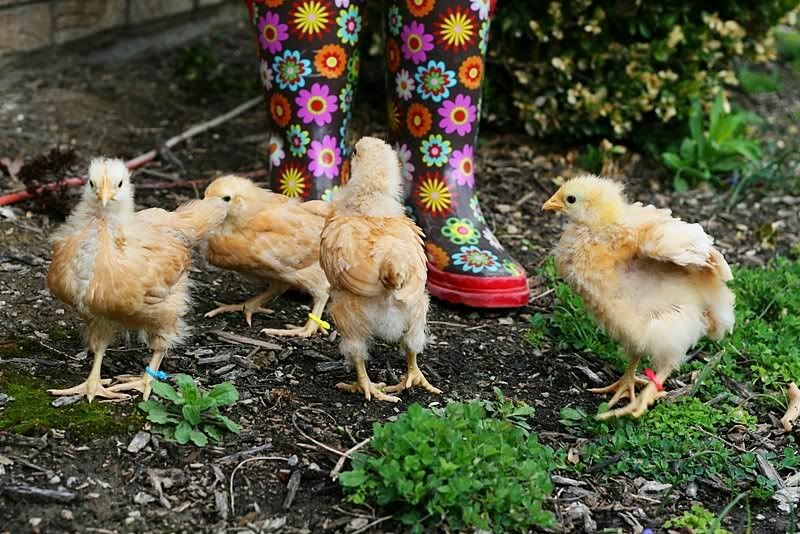 Our Country Chronicles: Do You Know How Fast Chickens Grow? Well. . . .Let me clue you in, but first it's important to note that as they grow, so does your love for them . I honestly never thought anyone could become attached to a chicken. I mean really, a chicken?!! Well let me tell you I could not have been more wrong! 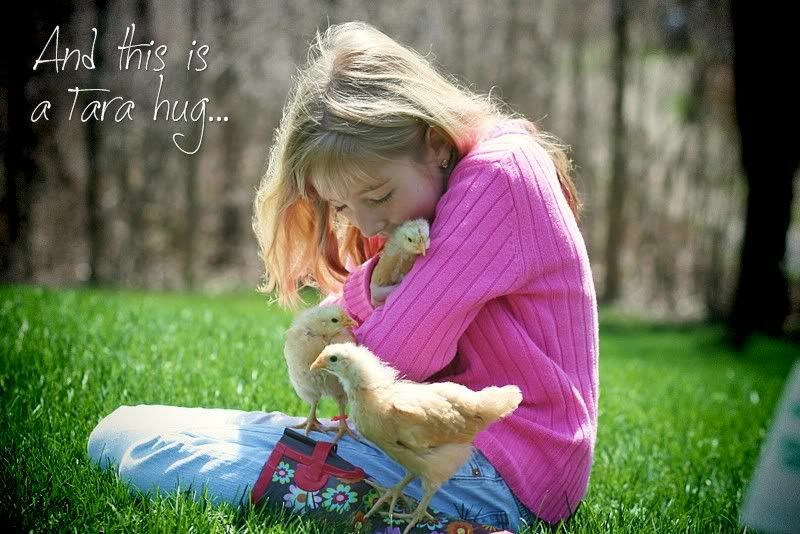 We love our chickies so much. Because there is so much growth that has occurred, this is going to be a picture packed long post. 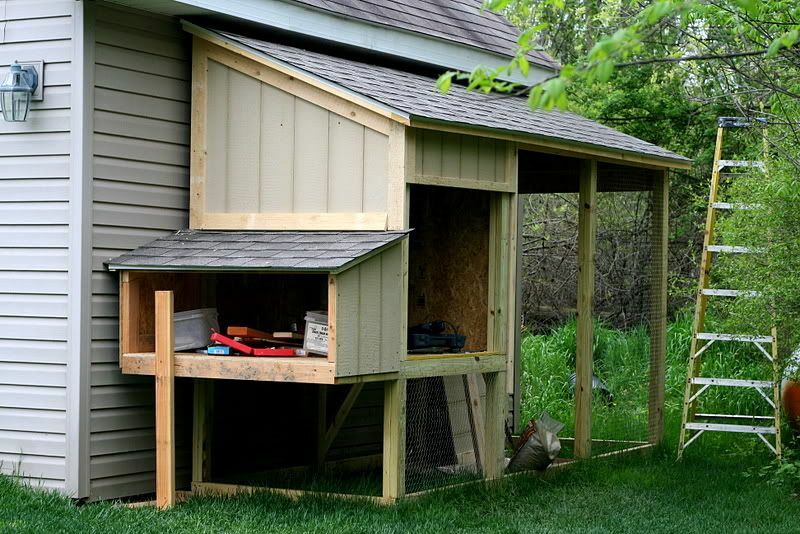 They stayed in the house with us for several weeks so we could monitor their body temperatures, and also so daddy had time to build us a coop. So in the meantime, the brooder in our kitchen was their cozy home. At 8 days old, they were growing their flight feathers and were practicing flying! And their Cousin Scarlett. 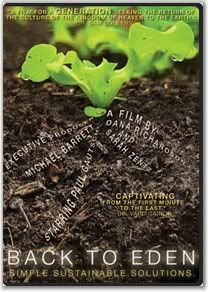 . .
And they just kept growing and becoming more attached to us as we began to love them more and more each day. 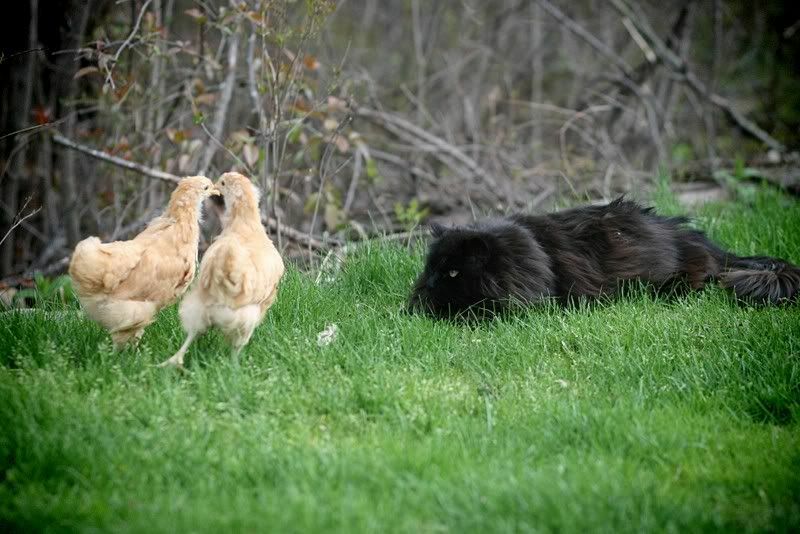 Our cat Caspian was extremely interested in the chickens. She really, really wanted some chicken nuggets! On Easter Sunday, the girls took them outside for the first time. They were 19 days old and so full of personality. The first time we put them on the grass, they hopped right back up onto Tara and Madeline's laps. 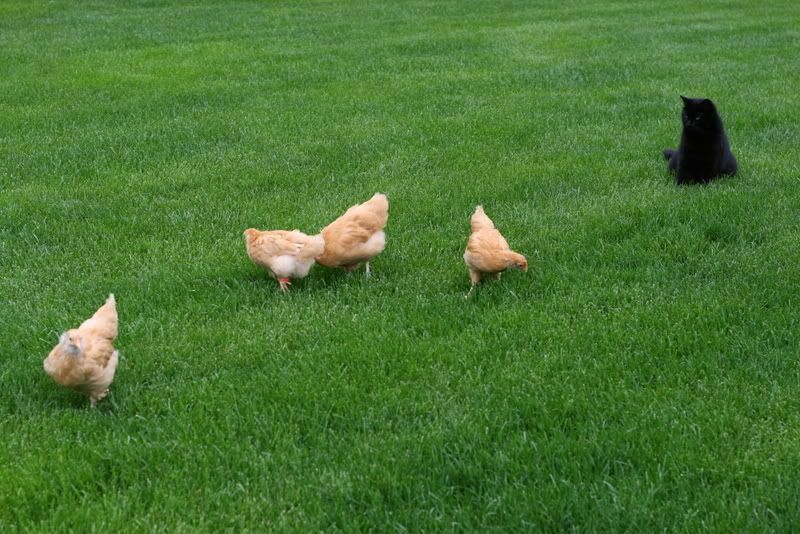 But soon they were exploring the grass while at the same time staying very close to their human family. 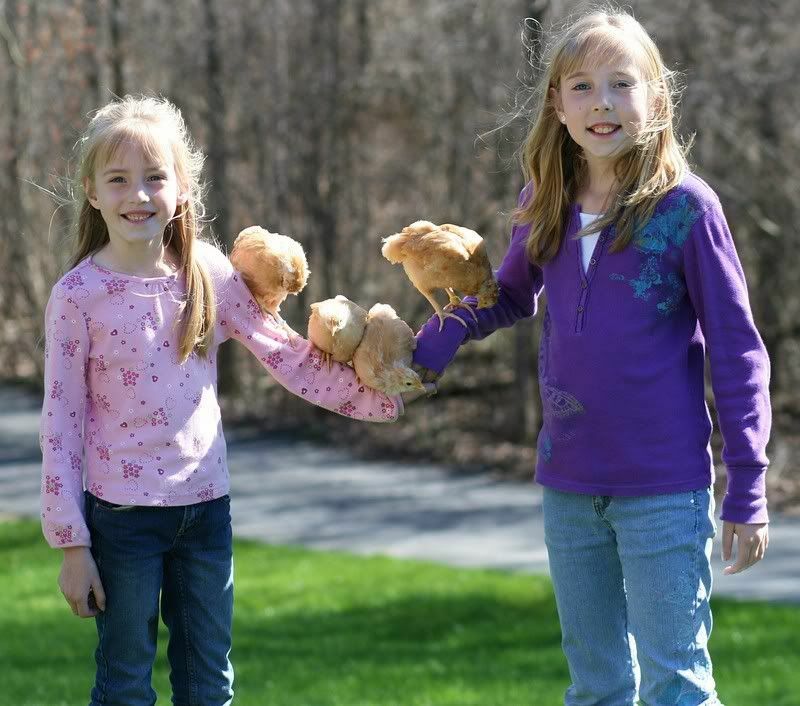 They had progressed to the awkward dinosaur stage where they were growing feathers but still had their peep fuzz. I loved hearing their peep, peep, peeps in the house with me as they grew. While the girls were at school, I'd take the chicks out one at a time to hold, cuddle, kiss and talk to them throughout the day. They were just so darned cute!! 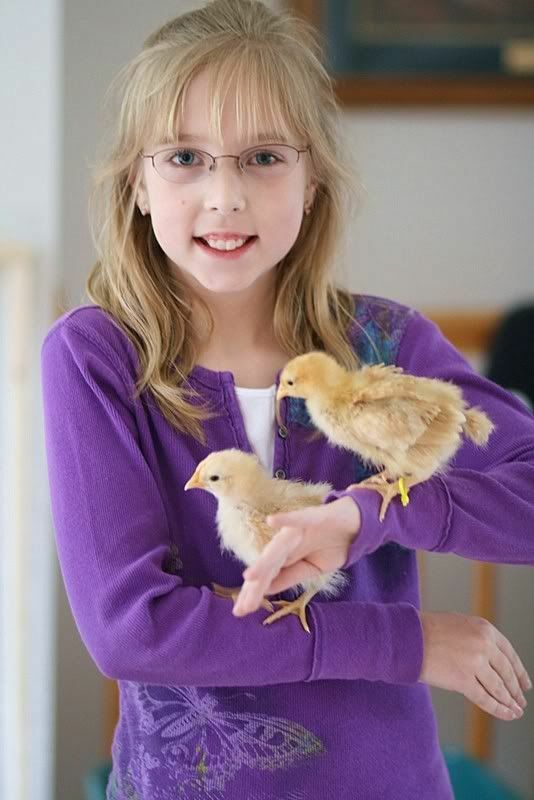 When anyone put their hand in the brooder, all the chicks would run up and even fly onto our arms. 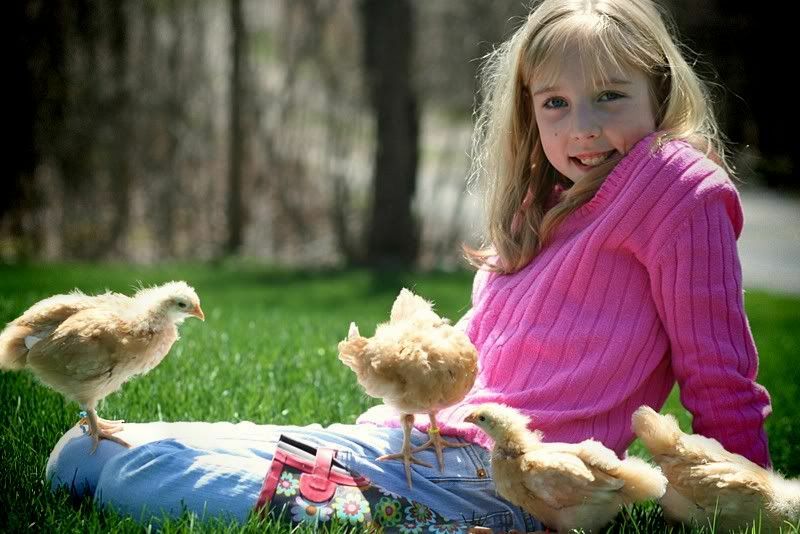 Each day after school, the kids would play with and take the chickies outside. 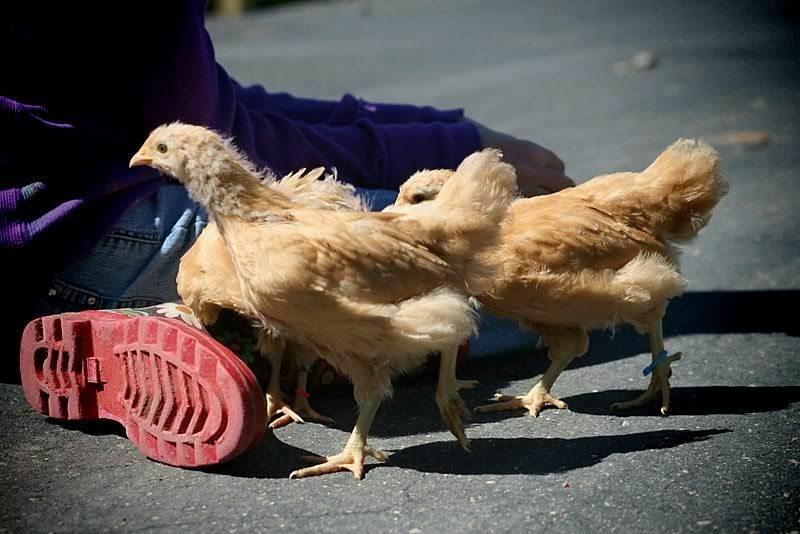 When they were newly hatched, we put a colored zip tie onto the ankles of 3 of them. That way, we'd always know who was who, and not get them mixed up. It turned out to be a great way to keep track of our girls and they still wear them to this day. Our hens think they are pretty bracelets. At three weeks old, they were just so adorable and fun to watch and play with. 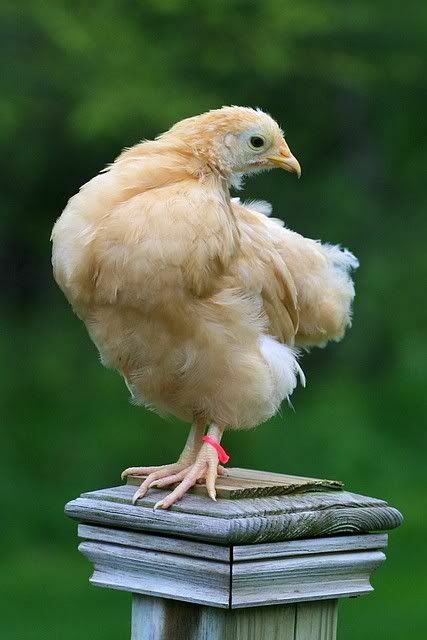 And Caspian was still hopeing to nab a taste of these chickies...dipped in ranch! 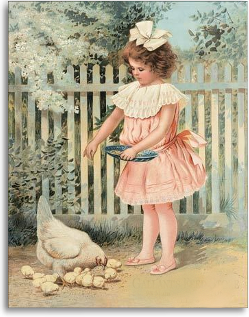 But unfortunately for her and her sister Faline, the chickens had grown and were no longer really veiwed as prey. I knew I should have eaten you when you were younger! 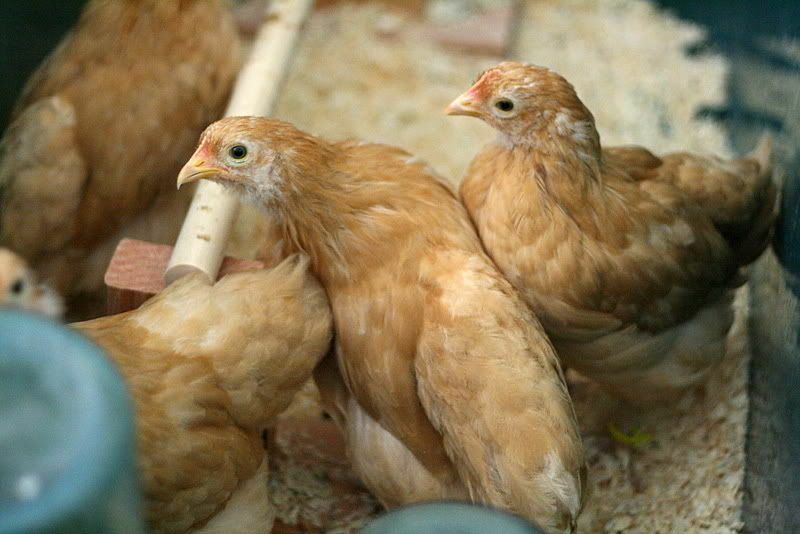 So quickly, they went from looking like little chicks to looking like little hens. Here they are at only 4 weeks! 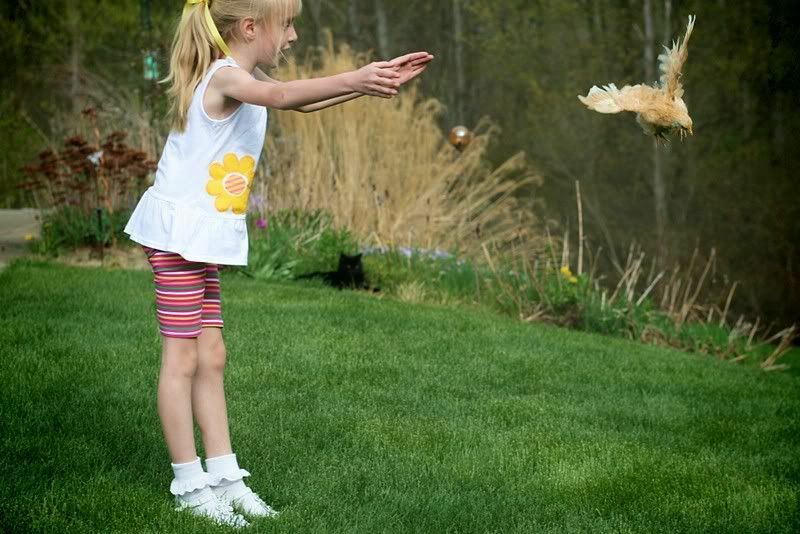 At 5 weeks, Madeline was teaching them to "fly like a birdie". On their 6 week birthday, our girls were given an official formal photo shoot! This is Dixie. 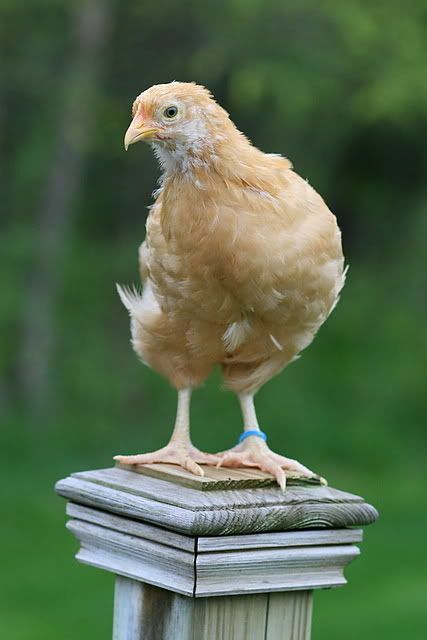 She is at the top of the pecking order and also our biggest little pullet. Tara thought she looked like Albert Einstein at this stage. This is Daisy and she is number 2 in the pecking order. And last, but certainly not least is Lily. Our sweet precious Lily. She was the smallest of the girls and she was my favorite. She was so sweet. She loved to be held and had a great personality. She was Tara and Madeline's favorite too. You just couldn't help it! Finally, here are all the girls with Madeline on their six week birthday. 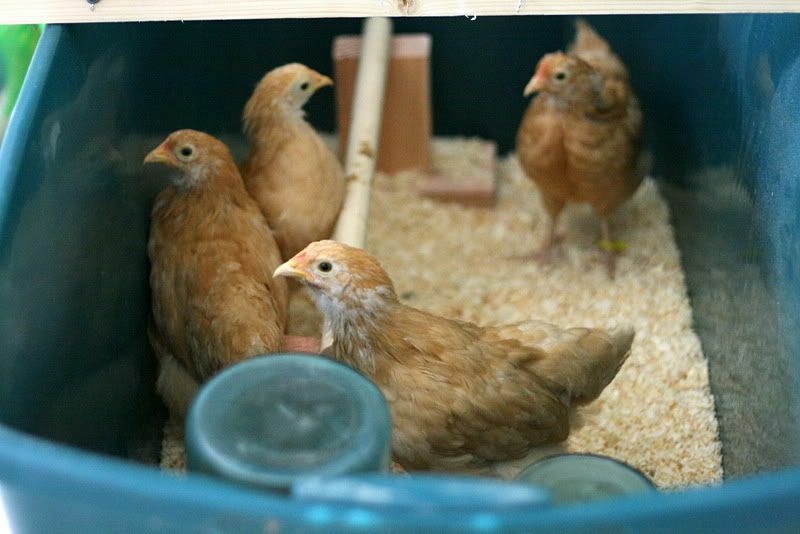 Now also at six weeks, they began to outgrow their brooder. . .
. . . while daddy slowly but surely worked on their new home. . .The coop! But true to the nature of this wonderful breed, they tolerated the confinement well and rarely squabbled with one another. 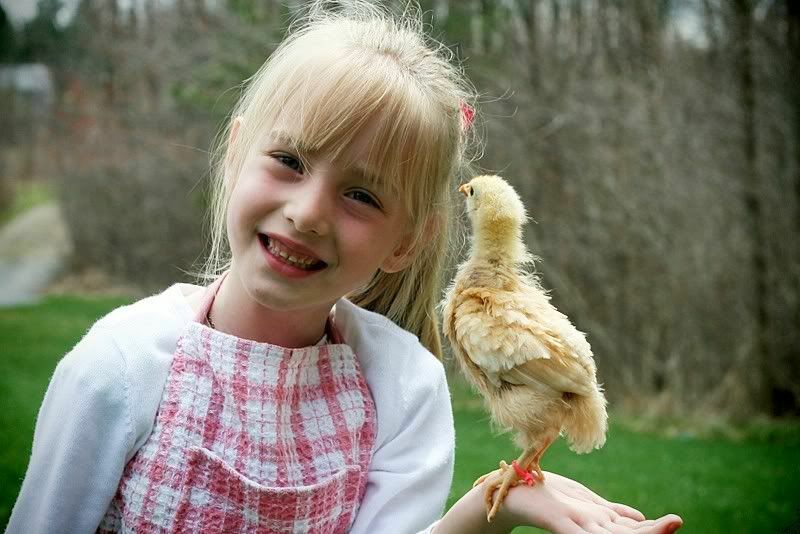 It is really a joyful journey raising chicks from day old peeps. 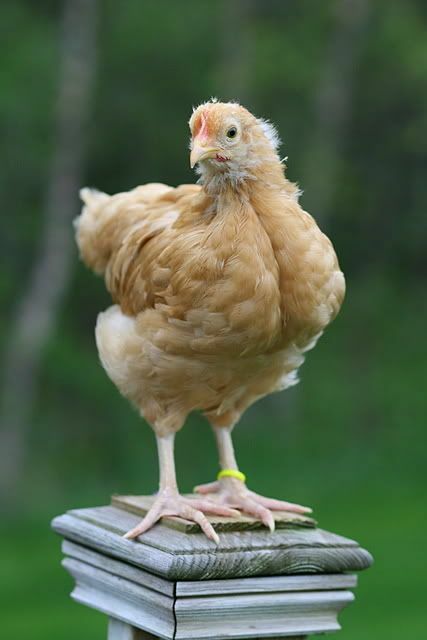 In the next post, I'll try to catch the chickies up to present day. See you soon! Beautiful pics! Amazing how fast they grow - it was a surprise to see them fully feathered so soon. Wish the ball of fluff stage would last longer. Kelly -- I can't get over your talent with the camera. I so enjoyed these images - every one of them! Awww. . . Thanks Lauren. There will be plenty more to come! I'm glad others can enjoy them because I certainly do enjoy taking them! We just got 8 chicks and I can see a difference in a couple days. It was nice to see these pictures. 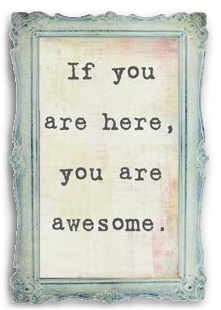 Love your page! 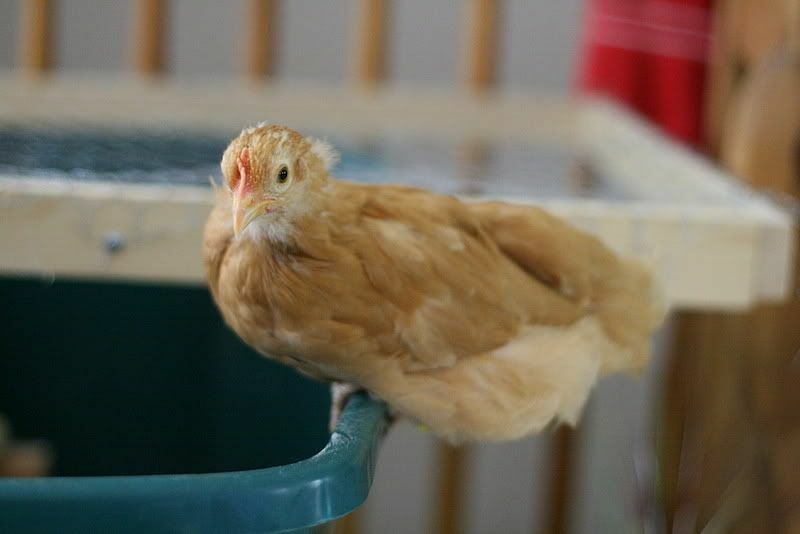 I just got two buff orpingtons and two New Hampshire reds and one hateful duckling :) We have had them not quite a week and I can see some changes, especially in my hampshires. 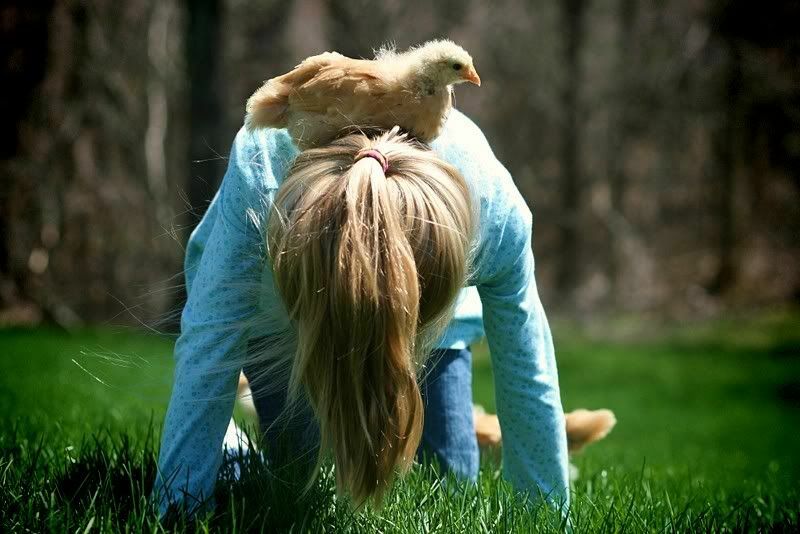 I have completely fallen in love with the chicks. Like you my smallest one (a buff) has stolen my heart because she snuggles. 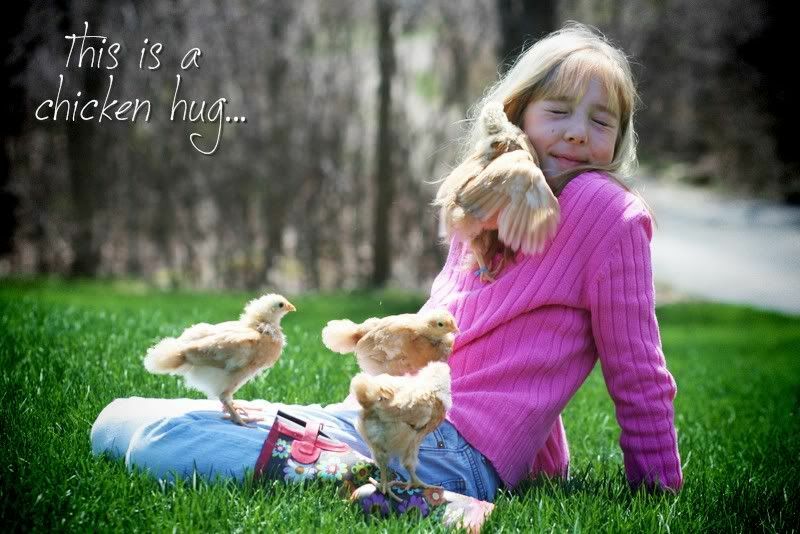 Just keep handling and snuggling with those little peeps. They grow up quick, and the more you handle them, the more they will bond with their human family. Enjoy!!! Love the page!! We just got some turkens,speckled sussex,black wyandottes,French black copper Marans,and Indian Runner ducks. Lol. They all have grown so much in the last 3 weeks,and my daughters just cant get enough of them. hatch last Friday and one of them has already started getting his real wing feathers. Such pleasure to watch them grow. 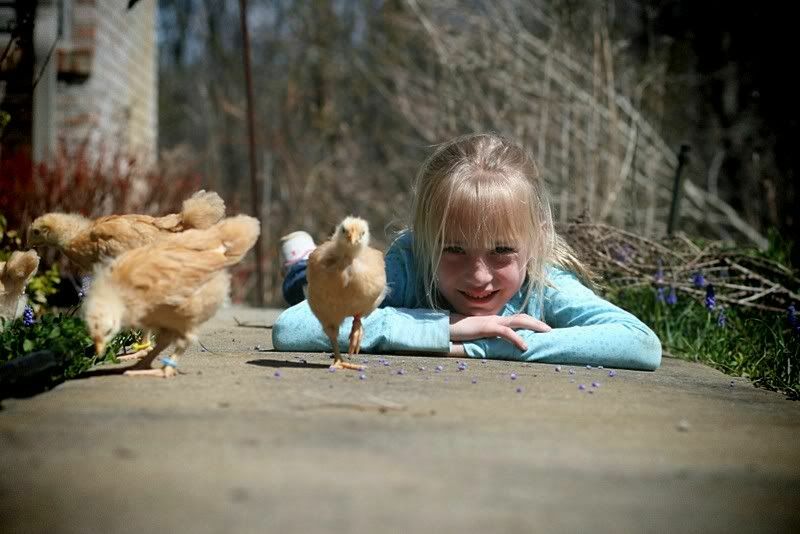 I love chickens. I didn't know one day I would fall in love with them. Such amazing birds! Thank you for sharing. 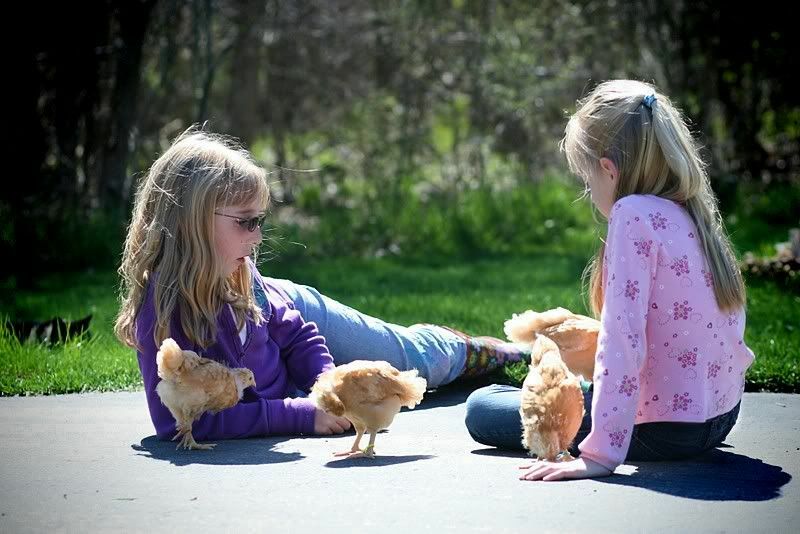 It's usually a very bad idea to let the children play a lot with young chicks, but your girls were very gentle, I can see it if the chicks ran on their lap so quick! 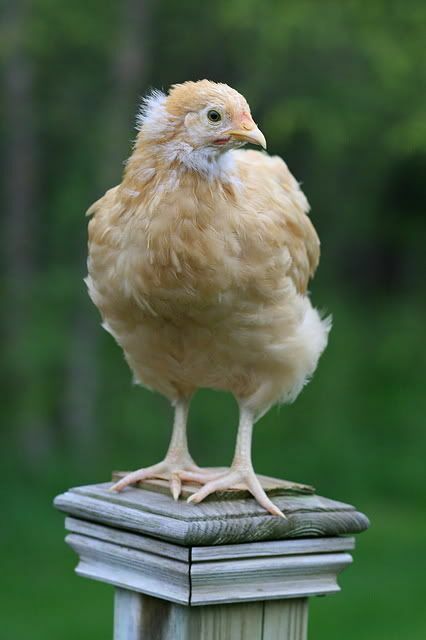 Just to be clear, chikens are not pets, one interested in chickens, should always buy at least 2 or 3, ensure they have heating while they are chicks, and enough grassy place when older. 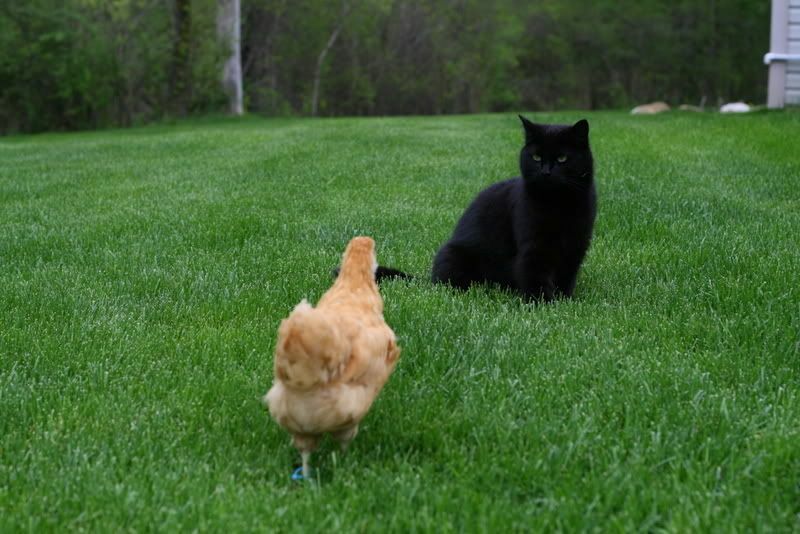 Just saying that for some of the readers on the Internet who think that a chicken is like a dog or a cat. It is not, but the affection bounds are as tight as with a cat or dog. A bird lover from Europe.